Food aside, what’s missing from your fridge? As long as it keeps food cold, and hooks you up with some cold water or crushed ice from time to time, there’s really nothing more we can ask from our fridges. At least, that’s how I felt before I went to Samsung’s appliance line unveiling and met my new favorite home appliance: the app fridge. 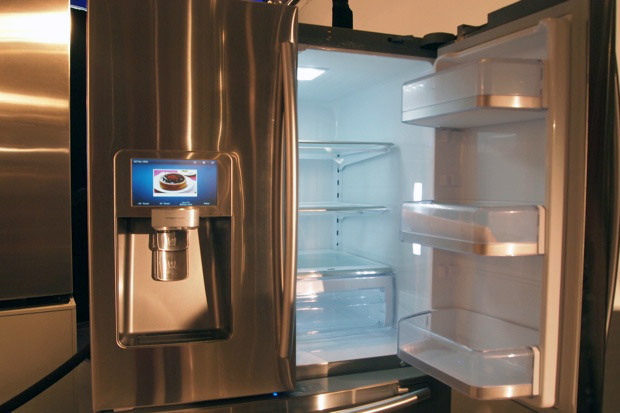 The app fridge comes in two different models: one with two vertical doors, and one with two vertical doors up top and two drawers down below. What’s different about this fridge is that just above the ice/water dispenser, there is an 8-inch Wi-Fi supported LCD screen that features a total of eight apps: Memos, Photos, Epicurious, Calendar, WeatherBug, AP, Pandora, and Twitter. Some of the apps are built by Samsung and specifically designed for the app fridge, while others are apps we’ve come to know and love. I got to play around with one today at the unveiling and from what I’ve seen, this is going to make a lot of moms happy. Instead of pinning a zillion photos, memos, grocery lists, etc. up on the fridge with magnets and ending up with a mess, the app fridge lets you store photos, memos and saved dates all on the fridge itself, organized neatly within that nice little 8-inch screen. Some of the apps are more useful and relevant than others, but overall they each fit well on the app fridge and I can understand why Samsung chose the apps it did. To start, the Photos app lets you upload pictures straight from a Wi-Fi camera or other Wi-Fi connected devices and then run the photos as a slide show on the LCD when it’s not in use. I actually got to watch a live demo of photos being uploaded from a camera to the fridge using Samsung’s AllShare software and it took no more than 15 or 20 seconds from the time the picture was taken, sans wires. The Calendar and Memos apps are pretty self-explanatory, so I won’t spend too much time on them. I will, however, say that there was one cool feature in the Memos app that I thought would really come in handy on a fridge. Within the Memos app you can post a memo right on the homescreen, just in case you want to remind your sweetie to pick up some milk. A touchscreen keyboard appears for text input in both the Calendar and Memos apps, and you also have the option to input text with your finger or a stylus in Memos, if you’re looking for a more personal feel. 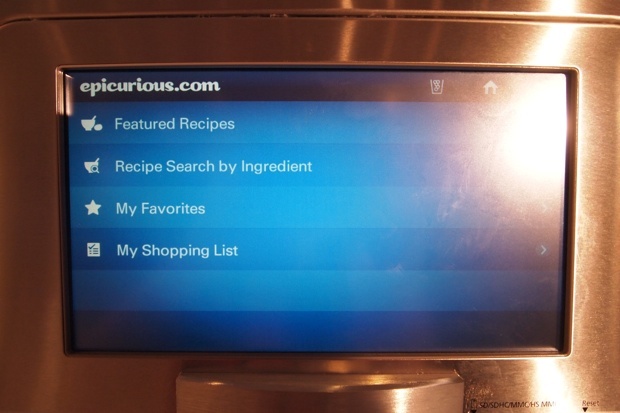 The most useful app for the fridge, by far, is the Epicurious app. It lets you search recipes by keyword and by ingredient, which comes in handy when all you have in the fridge are random odds and ends. Plus, you can browse through the app and look at all of Epicurious’ recipes. WeatherBug, of course, keeps you up-to-date on the weather outside, which doesn’t seem super relevant to the fridge itself. On the other hand, the fridge is kind of the information station for a family, where they can meet and figure out the day. In cases like that, WeatherBug suits the app fridge perfectly. The same basically holds true for the AP app, in that news surfing isn’t necessarily a fridge-related activity. Still, it’s nice to browse through breaking news during your afternoon snack. Overall I’d say the AP app is just as relevant as WeatherBug, albeit less useful than some of the other apps. The final two apps, Twitter and Pandora, I have mixed feelings about. Pandora can definitely come in handy during a dinner party, or even when you’re home alone washing dishes or chopping veggies. The only problem I have is that Pandora on the app fridge doesn’t let you create custom stations from the fridge. You have to go back to your computer or mobile app and add the station to your account before it’ll show up on the Pandora app on the fridge. This obviously isn’t a huge set back, but in my opinion, the more functionality the better. Twitter works the same way. Once you’re logged in, you can read your timeline just like you would on Twitter’s desktop client. You can’t, however, tweet something yourself, or reply, or send a private message. Just like Pandora is “listen only”, Twitter on the app fridge is a “read only” experience. I guess I can understand why Samsung chose to leave out the ability to tweet. Who wants to type tweets onto a fridge LCD when a smartphone is just a pocket dive away? Still, if something goes down in my kitchen that I am totally compelled to tweet, I’ll be sad to look over at an utterly useless (at least in that moment) Twitter icon on my fridge. 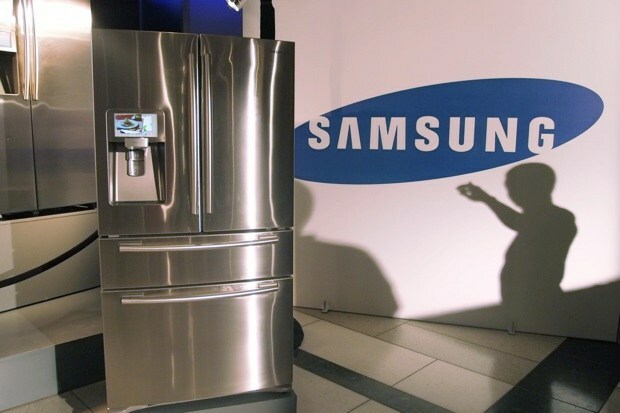 The Samsung LCD Refrigerator with apps is available for $3,499 (four door model) or $2,699 (two door model) at national retailers including Best Buy and Lowe’s.